JONESBORO, Ark. 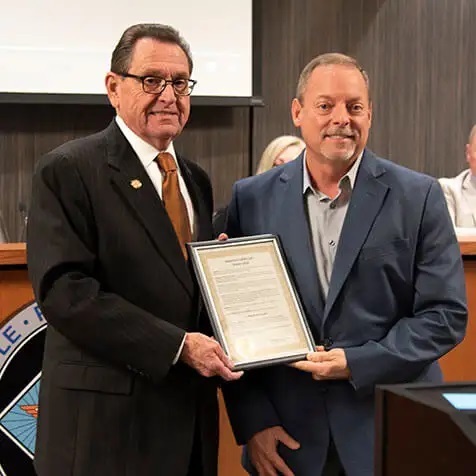 — Hytrol Conveyor Company, Inc. received a proclamation from the Jonesboro City Council for its Manufacturing Day 2018 activities. It was presented during the council’s meeting on Oct. 16. During Manufactuirng Day on Oct. 5, Hytrol invited students from Brookland and Jonesboro High Schools to tour its production facilities. The students also met with Hytrol employees to learn about the various careers available in manufacturing and discussed the need for skilled employees as technology evolves. Students from the summer’s Tek Starz program also presented Arkansas State University Chancellor Kelly Damphousse with an A-State sign they built during the camp. Tek Starz is developed by the Jonesboro Chamber of Commerce and Arkansas State University at Newport. The students visited local manufacturers to learn about the industry through hands-on projects. Manufacturing Day began in 2012 to foster interest in manufacturing careers. The industry currently supports more than 18.5 million U.S. jobs, but by 2025, 2 million manufacturing jobs are expected to go unfilled due to the skills gap. For more on Hytrol’s Manufacturing Day activities visit: https://youtu.be/_HAjRqsa2QI.